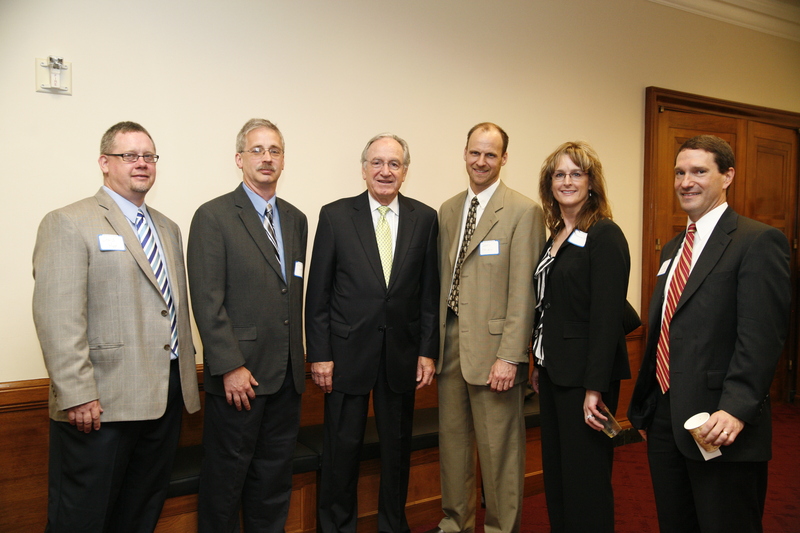 Members of the Iowa Telecommunications Association (ITA) spent May 16-18 advocating on behalf of the rural telecom industry in Washington, D.C. with representatives of the Federal Communications Commission (FCC) and the Iowa congressional delegation. The timing of these meetings is particularly important because of the anticipated adoption by the FCC of reforms of both the Universal Service Fund (USF) and intercarrier compensation (ICC) via an Order this summer. The ITA delegation of Chris Hopp, Roxanne White, Joe Snyder, Jerry Melick and OPASTCO Chair Ron Laudner joined ITA staff members Dave Duncan and Joe Hrdlicka in a trip that focused on advocacy on the rural local exchange carriers’ position in the FCC’s NPRM on USF and ICC. Kiesling’s Todd Thorson joined the group to present statewide data to the FCC. On Monday, members met with Angela Kronenberg, legal advisor to Commissioner Mignon Clyburn and a team of representatives led by Rebekah Goodheart, the head of the intercarrier compensation reform team in the Wireline Competition Bureau. Todd Thorson of Kiesling Associates presented data showing that for 2010 the average rate of return for consolidated operations (interstate and intrastate, regulated and unregulated, including broadband and wireless) for 108 clients was 2.63%. In addition, the ITA delegation referred to data supplied to the FCC by NECA that projected the impact of the FCC’s proposed USF reductions and access reductions. The NECA data showed that the USF reductions would cause 63% of Iowa RLEC study areas < 0% rate of return, and moving intrastate access rates to reciprocal compensation rates would cause 72% of the Iowa RLEC study areas below 0% return. The ITA delegation then discussed their specific company RoR, recent CapEx investment, percentage of revenues from USF and ICC, and impact of NPRM on operations. We then concluded by saying that even the state commissioners agreed with us on the problems in the NPRM, and we urged the FCC to adopt the RLEC national associations’ plan. During the meetings, Angela Kronenberg posed questions regarding the presentation on issues such as take rates, broadband adoption and voice versus wireless competition. In the meeting with Goodheart and other representatives in the Wireline Competition Bureau, members faced intense questioning regarding finances, operations and rate of return. FCC officials didn’t seem convinced of the case we made for sustainability of revenue within our industry. The delegation faced questions such as, “Why don’t you increase your rates?” and “Are your companies losing money on purpose to serve as tax havens?” Representatives of the FCC have a very clear “disconnect” with the needs of customers in rural areas, making our case more difficult to make. Learn more about Iowa’s grass-roots efforts and get the facts at The Great Disconnect.